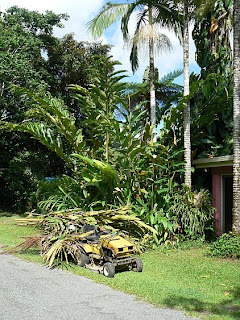 Daintree Valley Haven: The pruning continues! While folks further south brace themselves for Cyclone Ului here in the far north we are basking in perfect autumn weather. The garden at the front of the house has undergone a haircut - buried underneath that pile of vegetation is my trusty little trailer which, attached to the old ride-on mower, doubles as gardening-assistant and in the season (cleaned-up of course!) ferries the cleaning-gear for the bungalows.